This blog, was set up at the end of January 2011 to help promote my book of recipes––Delicious Dishes for Diabetics—which was published on the 4th of August in The UK and on November 1st in the USA. Today I’m publishing my 200th post! Better known for his role as the dashing Captain Ross in the 1970s BBC series ofPoldark, the writer having been diagnosed with Type 2 diabetes was determined to manage his condition through life style changes rather than medication. 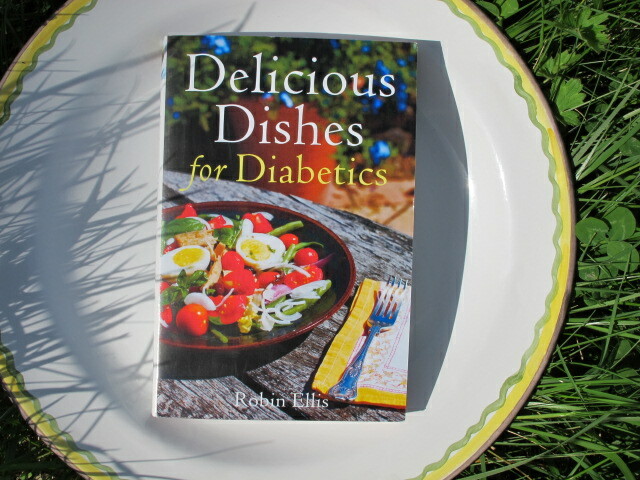 This is a very well written, visually attractive, concise cookbook, which appeals to diabetics and non-diabetics alike. It is organised in clear sections, from Soups in Section 1, through to Grains and Pulses in Section 11. Instead of the usual photos of dishes, there are enchanting illustrations instead. The recipes are tantalizing; Farinata (Pancake), Comfort Lentils and Caponata, to name just a few. My only criticism is that a few healthy puds or cakes could have been included as there is no sweet section. The book is based on the ‘Mediterranean’ diet; plenty of fresh fruit and vegetables, whole grains, fish etc. It really appealed to me, firstly being vegan vegetarian and secondly with Type 2 diabetes in my family. This book would make an ideal gift. How did I come to write a cookbook? I tell that story in my updated memoir, Making Poldark. That slim volume is being republished later this year, to coincide with the release in American of the boxed set of Poldark dvds by Acorn Media. I thought I’d share an excerpt of the new chapter with my blog readers…. “Why don’t you write a cookbook Robin?”. A cookbook? That’s a bit of a leap! I liked to cook—in fact that’s mainly what I did now. Twice a day I cooked (still do)—lunch and dinner–and did the marketing. Weren’t there too many cooks writing too many cookbooks? And I wasn’t a professional. It was flattering that friends suggested it though. My resistence stayed firm for some time–for a few years in fact. I was happy cooking for Meredith and friends who came to visit. I continued collecting recipes and pasting them in a red foolscap notebook—Ma had done the same in a blue one. We clearly shared a compulsive urge to look for recipes that work. Brother Jack and sister-in-law Christine kept my bookshelves up-to-date with the newest cookbooks—as did friends who knew I’d be delighted with any new addition. The pressure was growing though! When Meredith noticed me writing up a few recipes for the fun of it, she began to say at lunch and dinner tables, “Robin’s writing a cookbook”! About four years ago I’d started working with a laptop—more practical than the desktop in my office. One afternoon I found myself sitting in the shade under the trees in the garden, experimenting with an introduction to the putative book! Clearly I had started believing in the idea myself. The following summer a friend emailed me from her home in the Basque country asking for recipes. She knew I liked to cook, and was too busy working to do much searching for new dishes. It was a tipping point. I realised I had a range of interesting recipes ready to send off. These later formed the basis of the collection that Meredith packaged up to send to potential publishers, testing the waters. The response was friendly but unproductive. Unless you are a TV chef/cook or have a current celebrity profile, it is hard to interest that cash-strapped world. It is tough out there. Meredith then had a brainwave. It was obvious in a way, but one doesn’t always see clearly what is staring you in the face. There was nothing in the proposed book that I didn’t eat on a daily basis and I had been diagnosed 10 years earlier with type 2 diabetes. Meredith ate the same meals as me and didn’t feel deprived. This could be a book of everyday eating for diabetics that the entire family could enjoy too. Will you be doing an American book tour? No book tour as such, but we are planning top come to New York City towards the end of January and then onto Chicago and LA–maybe DC too. Can’t wait to buy my copy. Will look for it in New York next month. Thanks so much for all your generous, delicious and often times funny missives (email). How about Burlington, Vermont, on the way back? Mind you I shall be in Shetland & Cornwall in May…… Shelagh. I would guess you have read the full Poldark series (I don’t see more recent publications in your photo)? I have always thought that your blog picture wonderfully suggests what a Regency-era Ross Poldark would look like. With period-appropriate spectacles, you would need a few fluffy curls to be a circa 1820 Sir Ross. As many others would agree, it is awful to be subjected to Poldarkus interruptus. The TV series should be carried through to the end. Well we tried, we were committed–as I explain in the update. It was not to be. I have read them all and I enjoyed the last one especially–I think Winston fell in love with Bella as he had with Demelza. I have the original of this book from back with Poldark aired. I’d love to get the redo as well. Also have the Acorn DVD’s. Love it! I will be buying the new cookbook and looking forward to the new DVD set of Poldark! Great work! Everyone in my mother’s family suffered with type 2 diabetes, so I am very conscious of the problems and appreciate what you are doing in this area. Thanks, James–I hope you enjoy both! 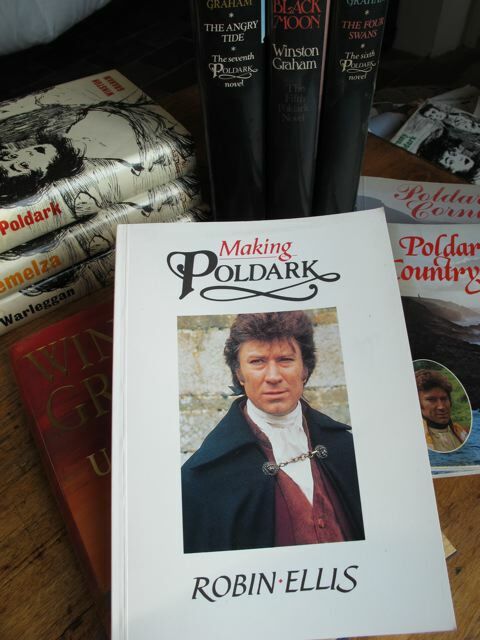 What wonderful news, that your updated book will be along very soon, I have managed to get your 1978 book Making Poldark,which I have throughly enjoyed. So I am looking forward to reading the rest. I enjoy your blog its’ alway so full of live and intrest. I love the cookbook, and have the DVD’s. I hope you come to Washington, D.C., as I would so enjoy meeting you, and having you sign my book! Reading the blog has been a great refresher for my busy day. Thanks Genie–see you in DC! I bought your cookbook on-line and am anxiously awaiting its arrival. It’s too bad that my local Barnes & Noble is not carrying it. By the way, I bought a set of the Acorn Media Poldark series about six months ago; with a 2010 copyright date. Is there going to be a newer edition? I’m near Boston and this set has been out for a year plus, according to the salesperson. Good luck with all your new ventures. on November 9, 2011 at 12:59 am | Reply Dianne P.
Congrats on the milestone! My husband & I look forward to hearing your news (and especially reading your lines in French). Congratulations on both the US launch and the blog! I thoroughly enjoy reading it each morning and often take inspiration from it for the evening meal after a day’s “verk”. The book(s) are both bedside reading for me in both Bath and London, so as to guard them from pilferers. The concept is entirely true and works brillilantly: healthy eating for both Type II-ers and their friends and family alike. It really is a good guide to healthy eating. Well Done, and looking forward to many more blog postings. Il faut–“keep on keeping on”– as Dylan sings. I think its the best idea your wife ever had!,you writing a cookbook! lol ,seriously robin,ive tried a few of the recipies now,and for me,who was once a ” sainsburys ready meals man” there really quite simple,and fun to make!. I had the pleasure of hosting 2 young french journalists from paris last week at my flat in glasgow,via couchsurfing,the delectable marie promptly dived into your book,and came up with a wonderfull meal!. The photos in the book,merit a “book to themselves” you and meredith seem to have captured cooking in all its forms stunningly!…thankyou. if he has a good recipe for “Cullen skink” or Scots Broth” be enteresting to see a french take on that!! Christmas is coming!,any ideas for diabetic party food? Thanks, Maurice–I’m glad you are well and truly weened off Sainsbury’s ready meals. I’ll ask Donald about the wonderfully named Cullen Skink—perhaps he has the Falkirk version. Christmas–well the fishcakes as a starter perhaps. I’ll think on it further. would just go away, so much pain and difficulty in walking living etc. How about a side trip to Long Island, I have a lot of nerve to suggest this.